When comparing spectrum analyzers, it has become common to reference a 100% Probability of Intercept (POI) specification. POI refers to the minimum transmitter pulse duration that can be detected with a 100% Probability of Intercept. When looking at these types of specifications, it is very important to understand the assumptions behind the claims and how they are calculated; with POI, it is essential to understand the span at which the POI spec is calculated. Let’s take, for example, another manufacturer’s spectrum analyzer that we will call Product X, which claims the following specification in their printed literature: “10,000 spectrums per second with 100% probability of capturing transients with minimum duration of 125 microseconds.” This is certainly an impressive spec. However, it only applies when the span is set to a single instantaneous bandwidth block of 20 MHz wide and it ignores the remainder of the spectrum. The 100% POI, defined in this manner, is only meaningful if you already know what the frequency is of the suspicious signal. This specification could be very useful for in-depth analysis of a specific known intermittent signal, for example product development testing. However, if you are looking for unknown signals that could be anywhere in the spectrum, or at least beyond a 20 MHz span, this definition of POI is NOT useful. The graphic above highlights a 20 MHz span. This span is not large enough to display even the entirety of a WiFi signal. Also missed is the surrounding spectrum where another possibly suspicious signal is lurking. All modern spectrum analyzers have a front-end analog sweeping block which breaks the spectrum in ‘blocks’ equal in size to their instantaneous bandwidth. Following that, an analog to digital converter samples this instantaneous block bandwidth for digital processing. When looking at Product X, the digital side is really fantastic and great for looking at 20MHz blocks one at a time.Yet, the analog front-end is very slow. When looking for signals where the frequency is unknown (meaning the user needs to use a wide span) and considering a 100% POI type of specification, it is vital to consider a whole range of values depending on the frequency span. 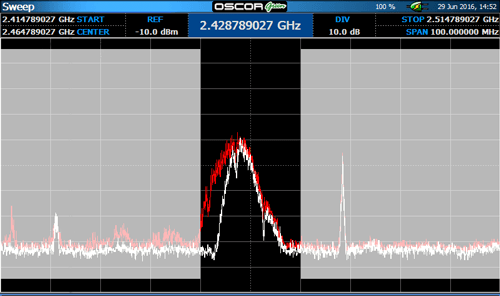 The OSCOR Green sweeps a full 24 GHz in one second at a 12.2 kHz resolution. When the span is narrowed, the sweep rate increases. Therefore, the 100% POI gets smaller and smaller. This is a much more practical manner to compare this spec for unknown signals. When searching for unknown signals, the OSCOR Green provides an outstanding sweep speed performance and corresponding 100% POI. The analog sweep speed and corresponding digital processing are well-balanced to provide the best of both worlds when searching for unknown signals.